Since the early 1990s, the achievement of ‘good governance’ has been a dominant discourse in the pursuit of social and economic development. This book presents a critical challenge to the contemporary development paradigm of good governance. 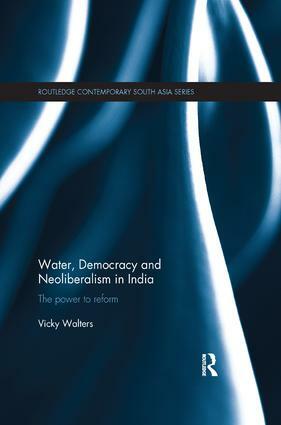 Based on original ethnographic fieldwork on urban water governance reforms in south India (Karnataka), the book examines the two propositions that underlie the current good governance debate. The first refers to a claim that good governance is both democratic and pro-market. The second to the claim that commercially-oriented water services, whether private or public, are good for poor and marginalised citizens. The book analyses these propositions as they intersect on three levels: policy, practice (process) and outcome. It argues that a number of tensions and contradictions exist within and between what the discourse promises, the everyday practises of how good governance policies are implemented and in the outcomes of such. It reveals the networks of power and the complexity of local reforms and their relation to global discourses as well as the motivations and every day practises of those who currently possess the power to reform. The book is of interest to academics in the fields of Development Studies, Asian Studies and Comparative Politics. Can we have a civil-consumer slum, please . . .